Pendruffle Cottage is a delightful and romantic getaway, perfect for couples. It enjoys views over the river, inlet and also over the peaceful countryside. This is a very relaxing environment and enjoys a corner jet bath. Pendruffle is a Luxury one bedroom cottage over 3 floors. It is Set on a hillside overlooking the river, this picturesque cottage with its beautiful views gives you a feeling of tranquility and relaxation. 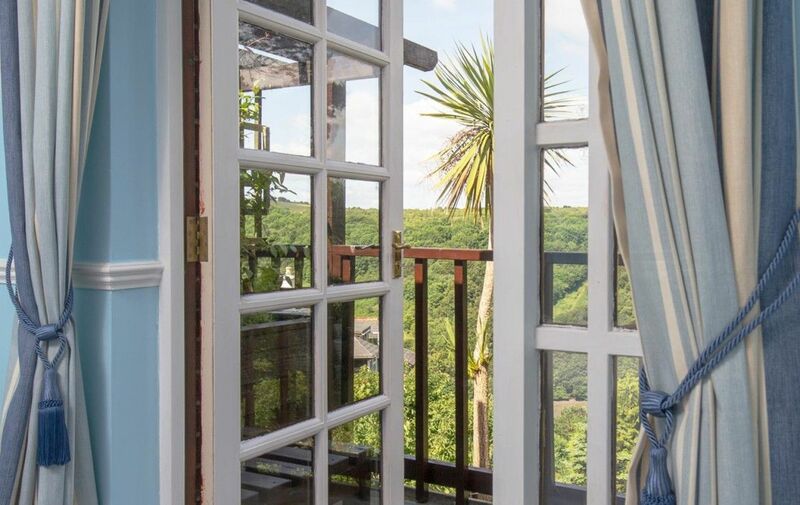 The Stunning views of the Looe River country side can be admired from ground floor and from the bedroom balcony. Pendruffle is a 5 minutes walk from Looe Harbour/Town. As you enter the cottage you have a comfortable lounge with a Flat screen TV and DVD player, there are a selection of DVD’s to watch at your leisure. The kitchen is fully self contained with built in dishwasher, fridge freezer, washer/dryer. The Master bedroom has a Super King bed, dressing table, chest of drawers and an area to hang your clothes. There is a balcony off the bedroom, where one can enjoy a morning coffee. The spacious bathroom has a double shower, wc, basin and a jacuzzi bath. Towels are included. The location of Pendruffle Cottage is quite unique being set upon a hill with wonderful views overlooking the East Looe river and sea inlet. The access from the main road to the cottage is via a steep wooded track with a sharp right hand bend which should be taken in a low gear leading up to a car parking area. Pendruffle is then approached from the car park by a down gradient pathway with a hand rail for anybody with walking issues with Pendruffle being the second cottage on your left. The cottage has its own pathway with a up gradient pathway with a few steps leading up to the ground floor patio and entrance. To access Looe from the cottage you turn right at the bottom of Pendruffle pathway walk up the pathway until you come to some steps leading down to Barclay House driveway where you can access “St Johns Walk” to the village centre taking approximately 5-10 minutes to walk. Address: St Martin's Rd, Looe, Cornwall, PL13 1LP.